Samsung has launched a Limited Edition Alpine White variant of the Galaxy Note9 and a a Dual Tone Polaris Blue version of the Galaxy S9+ in India. 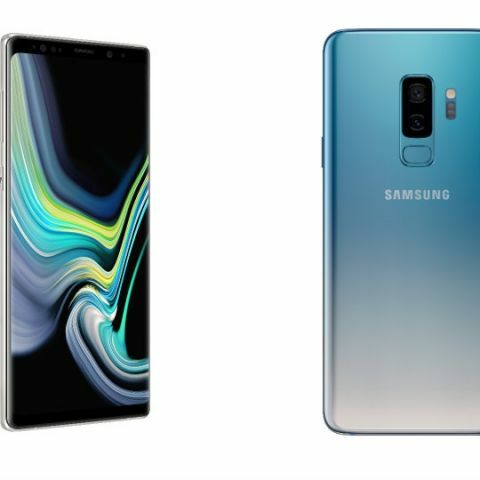 With the launch of these new colours, Galaxy Note9 will be now available in five colours including Ocean Blue, Midnight Black, Metallic Copper, Lavender Purple and the all new Alpine White; while Galaxy S9+ will be available in Midnight Black, Coral Blue, Lilac Purple, Sunrise Gold, Burgundy Red and the latest addition, Polaris Blue. The Alpine White edition of the Galaxy Note9 will be available in the 128GB storage variant for Rs 67,900 and Galaxy S9+ Polaris Blue will be available in the 64GB storage variant for Rs 64,900. The devices can be pre-ordered at Samsung Online Shop and across selected online platforms starting December 7. These phones will also be available at offline stores starting December 10. Both the new variants of the Note9 and S9+ come with offers from Samsung and partner banks. Customers can avail an exchange bonus of Rs 9,000 on exchanging select old smartphones. Alternately, customers can avail Rs 6,000 cashback if they pay through HDFC credit or debit cards. Additionally, customers can avail Rs 3,000 Instant Cashback on Galaxy S9+ Polaris Blue. All Galaxy Note9 variants come bearing the same specs. The phone sports a 6.4-inch Quad HD+ Super AMOLED display with a resolution of 2960x1440. Its Infinity Display is complemented by stereo speakers tuned by AKG, which also come with support for Dolby Atmos. For its processing needs, the Galaxy Note9: First Snow White houses a Qualcomm Snapdragon 845 10nm 64-bit Octa-core chipset in the US. In India, the Galaxy Note9 is powered by Samsung’s own Exynos 9810 chipset. The phablet includes Samsung’s Water Carbon Cooling technology to keep the phone cool during intense gaming sessions. On-device AI-based adjusts algorithms to deliver stable performance. In the camera department, the Galaxy Note9: Alpine White houses the same dual-camera system with Dual OIS on the rear. Both the wide-angle and telephoto lens have a 12MP sensor. The wide-angle sensor has F1.5/F2.4 variable aperture and the telephoto lens has a F2.4 F-spot. The front camera has an 8MP sensor with F1.7 aperture. It features 128GB storage and 6GB RAM. The full package is powered by a 4,000mAh battery. Samsung recently launched the new One UI Beta for the Galaxy Note9 phones in India. One UI brings a string of changes to the device’s interface and adds loads of new features. You can read more about it here.